Turrican’s final outing on the Amiga in Turrican 3 (making Turrican 2’s sub-title, The Final Fight, less than accurate) is something of a mixed bag. Judged on its own merits it’s a perfectly serviceable and entertaining shoot-‘em-up, once again showcasing the Amiga’s strengths as the premier games platform of its time. But coming after the near flawless Turrican 2 and the ground-breaking original Turrican, the swansong of the trilogy always had a lot to live up to, something it doesn’t quite manage. 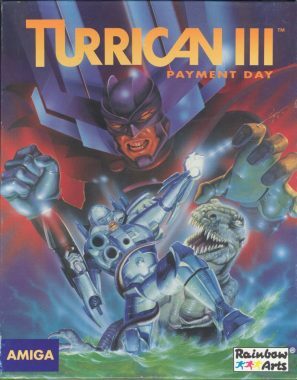 As the game’s comic-book style opening sequence informs us, eons have passed since the defeat of the evil overlord known as The Machine, Turrican 2’s main antagonist. However, The Machine is back, terrorizing the galaxy once more and enslaving countless people across numerous planets. The USS Freedom Forces deploys Bren McGuire in the mechanized Turrican suit once again to take on the forces of The Machine and rid the galaxy once and for all of this evil overlord. With the plot established, it’s time for the blasting to begin and first impressions, graphically at least, are not good. a step backward visually. The color scheme on many of the levels just doesn’t have the same sheen to it. The main Turrican sprite has been given an overhaul too; the suit appears bulkier with more formidable looking armor, but its silky-smooth animation as seen in the first two games is no longer present. 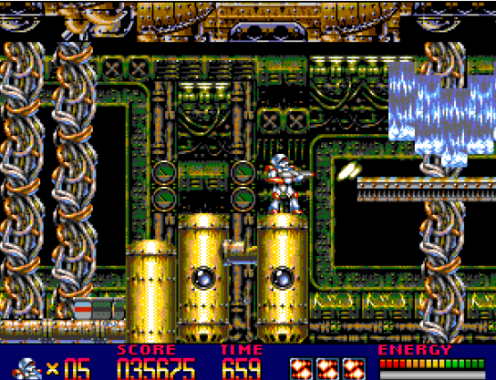 There’s a slight but noticeable stiffness in Turrican as he moves across the screen. A drab dark navy strip at the bottom of the screen hosts information such as lives, score and energy. Overall the visuals fail to impress, remarkable given that Turrican 3 was developed for the more graphically advanced AGA-based Amigas. Scrolling is super-smooth and multi-layered, but by 1993 multiple levels of slick parallax scrolling were a ten-a-penny. Shooters needed something a little different to stand out. Sound and music are of a typically high quality we’ve come to expect from Factor 5 with the music (by Chris Huelsbeck) worthy of special mention. While the soundtrack may not quite equal the dizzying highs of Turrican 2, most of the tracks present are still superb and further cement Huelsbeck’s well-deserved reputation as one of the most talented composers the games industry has ever seen. Turrican must make his way through a succession of levels, fighting off The Machine’s hordes and collecting valuable power-ups along the way. All the weapons from Turrican and Turrican 2 make a reappearance. You start the game with a single forward firing gun which can be upgraded to a threeway multiple firing weapon. 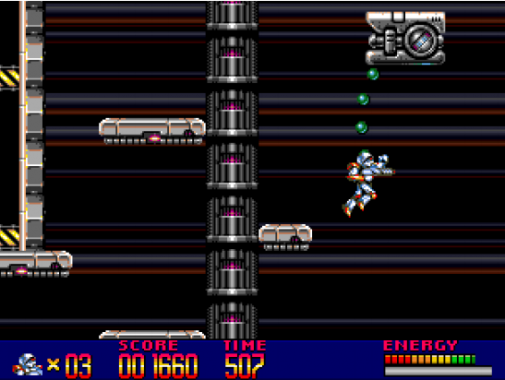 Bounce, as seen in Turrican 2, features again though its firing pattern has been altered. Instead of a single projectile colliding with scenery and bouncing off into multiple smaller projectiles at different angles, Turrican 3’s bounce weapon fires forward, as well as vertically up and down. It’s not particularly useful however unless there are bad guys directly above or below you. The stunning laser weapon from Turrican 2 has, disappointingly, also been tinkered with. While not that impressive in the original Turrican, the full-strength laser weapon in Turrican 2 was a joy to behold, a red and white-hot wall of spear-shaped plasma, cutting through everything in its path. Turrican 3’s laser is, visually at least, at lot less impressive resembling something like small green clouds, with no real depth or sense of power. 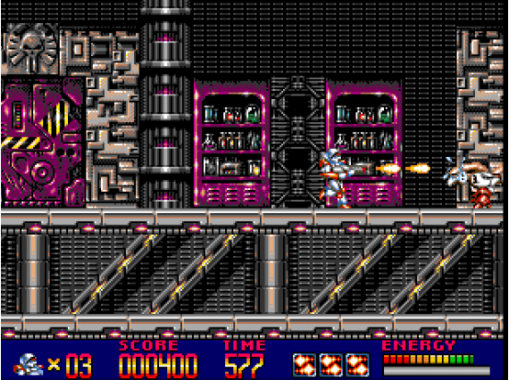 Turrican can also collect homing rockets from the power-up crates which appear around each level. These rockets will zero in on any bad guys nearby. The one-use superweapon from Turrican 2, which was activated by holding down the joystick and pressing the space bar, is absent which is a pity as unleashing every weapon at your disposal was always a jaw-dropping sight, not to mention useful against some of the larger enemies. The power lines from the first two games are present again although this time they emanate from the player in a series of concentric circles, widening out until they disappear off screen. The lifesaving gyro mode from the earlier games is also back. Pressing down and holding the fire button for a second will activate gyro mode (this is admittedly a little more convenient than Turrican 2’s downand-spacebar method, which was always a bit tricky to accomplish, especially when under pressure). This time around, there’s a limit imposed on the amount of time you can spend in gyroscope mode. On entering gyro mode, a bar underneath your energy level begins to decrease. Once the bar runs out, you’re immediately changed back to standard suit mode. As an extra challenge, the game makes you wait a short while before you can enter gyro mode again. The biggest change to Turrican’s arsenal of weapons however is the omission of the deadly 360- degree laser weapon. It’s been replaced with… a rope. That’s right, instead of the ability to swirl laser death around your head at incoming enemies, you can now throw a rope at them and run in the opposite direction. I’m being a bit unfair here of course. The rope isn’t intended as a weapon but as a way of reaching inaccessible parts of the screen. You’ll often see bonuses such as energy upgrades or even extra lives floating temptingly in hard-to-reach areas, so you’ll need the rope to reach them. Using the rope is simple enough, though it takes a bit of practice. Holding down the fire button will shoot the rope in whatever direction the gun is aiming (you can shoot it ahead or diagonally). If you’re aiming at something which can be latched on to, the rope will connect to it and the player can ascend to a previously unreachable part of the screen by pushing up on the joystick. They can also lower themselves back down. To release the rope, hold the fire button again. The rope will flash several times and an upward tap on the joystick will disengage the device. You can also use it to swing across chasms though you’ll need to coordinate disengaging it quite carefully if you’re going to avoid plummeting to your doom. Be warned, while Turrican is using the rope, he’s completely vulnerable. You can’t fire any of your gun weapons though you can still activate power lines, so don’t hang around (aha!) too long while using it. Some parts of the landscape are inaccessible without using the rope. And battling at least one of the end-of-level guardians requires you to constantly swing across the monster’s lair from side to side in an effort to target the monster’s vulnerable spots. This is quite a nice touch as it lends an extra tactical element to combatting a guardian, a welcome change from sitting in one spot, mindlessly pumping a boss full of lead. To be fair to the designers, they’ve clearly tried to inject some new blood into the Turrican series with this radical change. But the 360-degree laser was such a visually impressive and indispensable tool that its omission makes this feel like any other shoot-em-up, not a Turrican game. While the rope introduces a new element to the gameplay, it’s at the cost of one of the most integral and wellloved features of the first two games. There are some entertaining set-pieces throughout, including a frantic sequence jumping across the hoods of cars suspended in mid-air (don’t ask). But overall the gameplay feels a bit tired. Turrican 3 isn’t a bad game. It’s polished, professional and certainly fun in parts. But its predecessors set an extremely high bar which it can’t reach. Tampering with the mechanics of the game raises an interesting dilemma; change too little and people will complain that it’s just more of the same (a criticism some reviewers aimed at Turrican 2). But change too much and you risk diluting the essence of what made the series so great in the first place. Turrican 3 falls into the latter trap. While entertaining in its own right, it misses out on classic status and remains an interesting but flawed conclusion to arguably the greatest shoot-‘em-up series ever released for the Amiga.